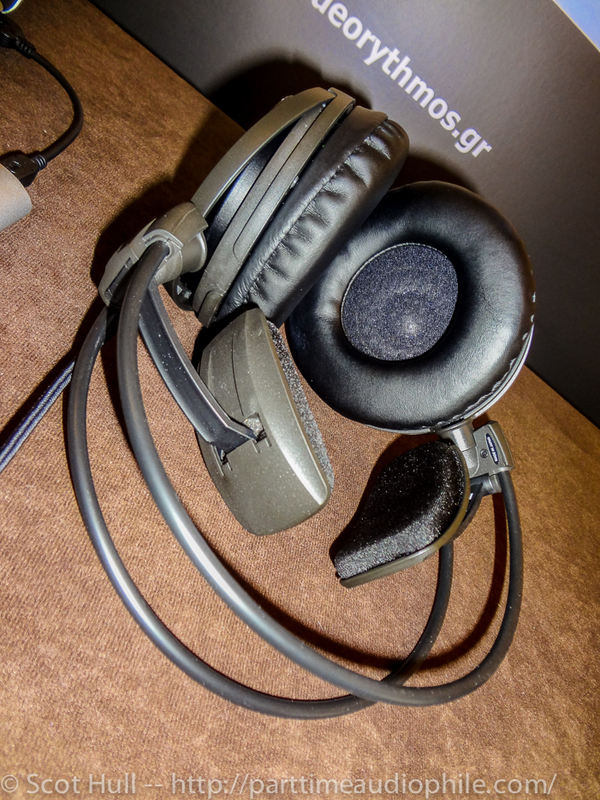 The first Greek headphone fest has closed its doors only a few hours ago and the dust has not yet settled. 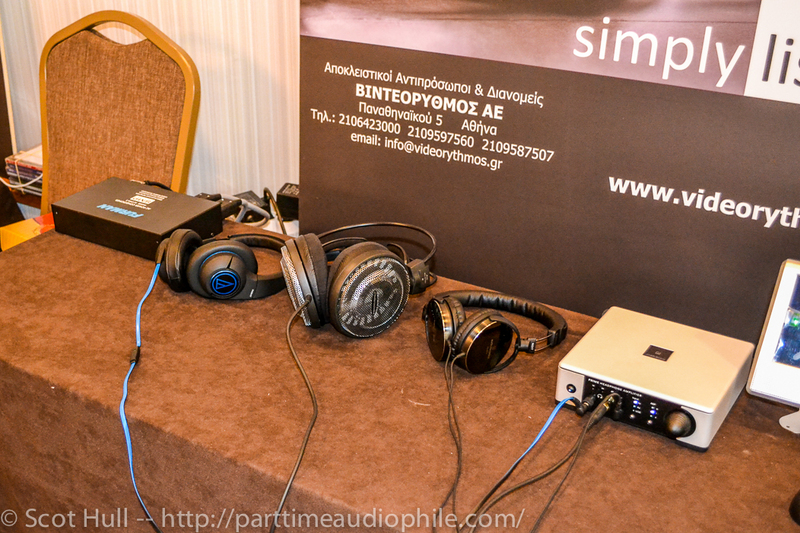 Some 500+ visitors had the chance to see, touch and listen more than 40 complete set ups from some 80 different brands and the 9 official hours of the show seemed too few to let everyone grasp a small sample of what each combo offers in terms of built quality, convenience and most important, the sound. Considering that in each table more than one combination of headphones and electronics were available, it was absolutely impossible to listen to every single piece of equipment. Sony alone had dozens of models, AKG and Shure the same and many of the exhibitors allowed visitors to swap gear so one had to carefully choose what to go for. So did I, pointing mostly for interesting combos and novelties. 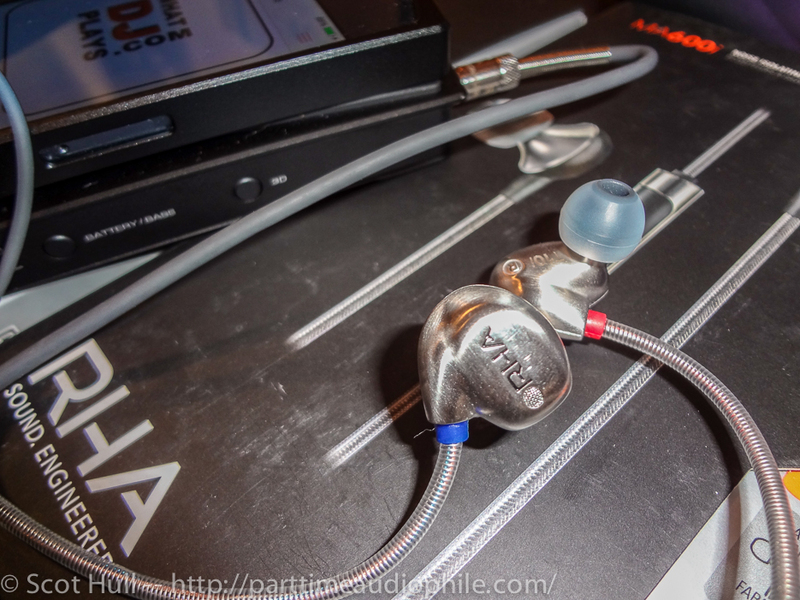 RHA has been producing some very interesting earphones with exceptional built quality for the money. 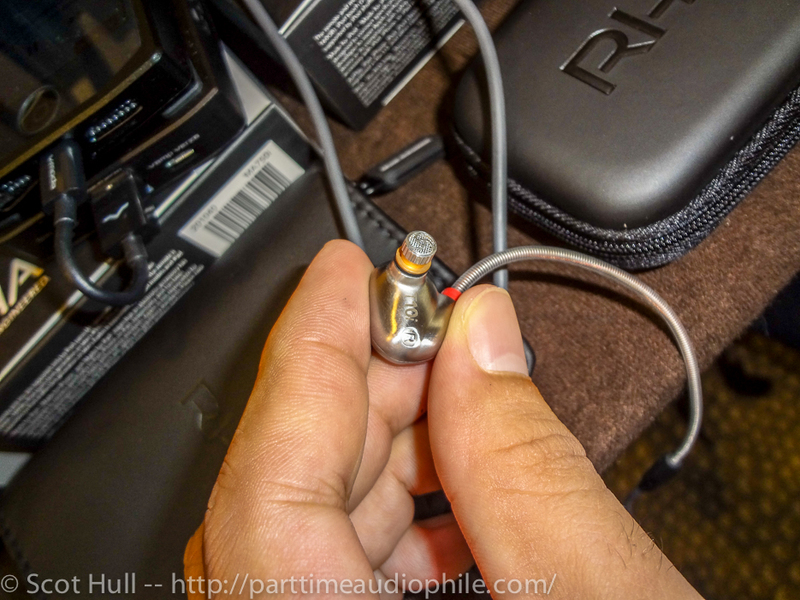 All RHA models were on display but the one that clearly stands out is the new T10i which pushes the company’s technological knowhow into cutting edge territories. Patent pending over-ear hooks designed to hold the headphones in position with the cable running over and behind the ear, injection molded stainless steel body and a newly designed driver with interchangeable tuning filters. 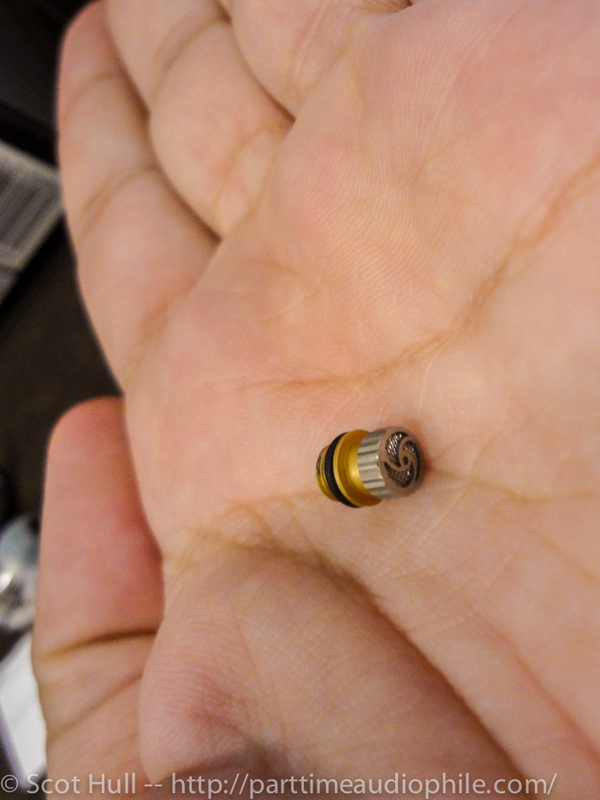 These filters come in three flavors: “treble”, “reference” and “bass”. As the T10i is designed to perform with the Cupertino’s “i” family of products I gave them a listen with an iPhone 5 which was more than enough to drive them. On Black Cofee’s remix of Gnarles Barkley’s “Crazy” the different filters provided palpable variations in the tonal character of the T10i. I would go for the “reference” one, I hardly consider myself a “bass lover” but you might enjoy more one of the other two filters. 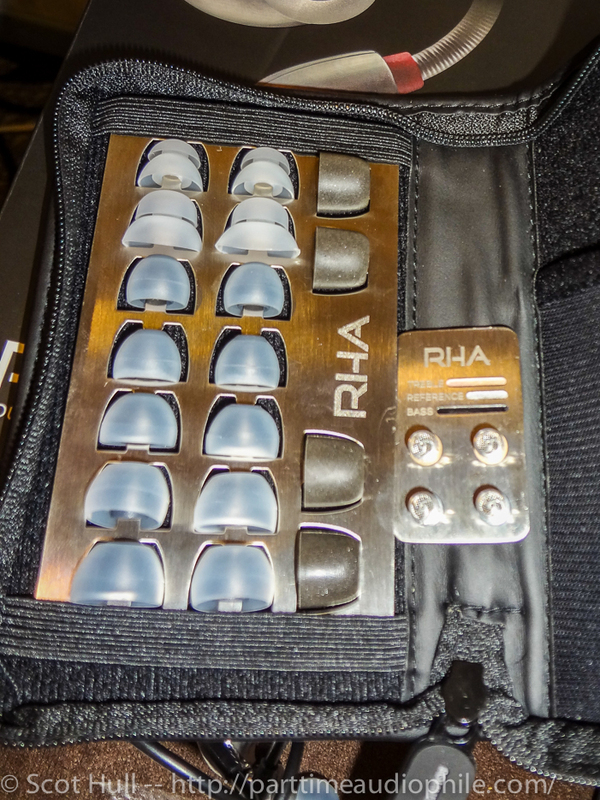 RHA offers this amazing piece of gear with a leather case stacked with all possible ear tips including dual density silicone, double flange silicone and memory foam ones. 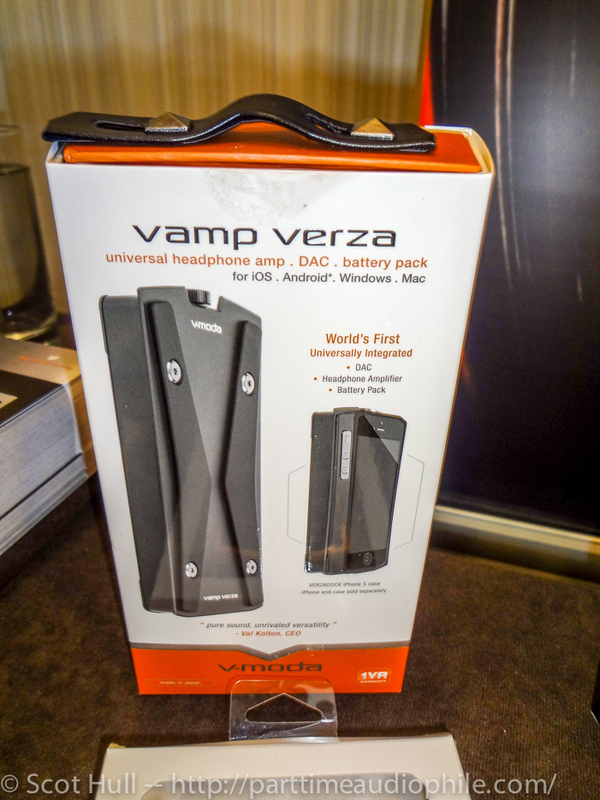 For those seeking more power from their cell phones in order to drive lower sensitivity cans or simply obtain lower distortion at higher volumes, the V-amp Verza from V-Moda can make the difference. 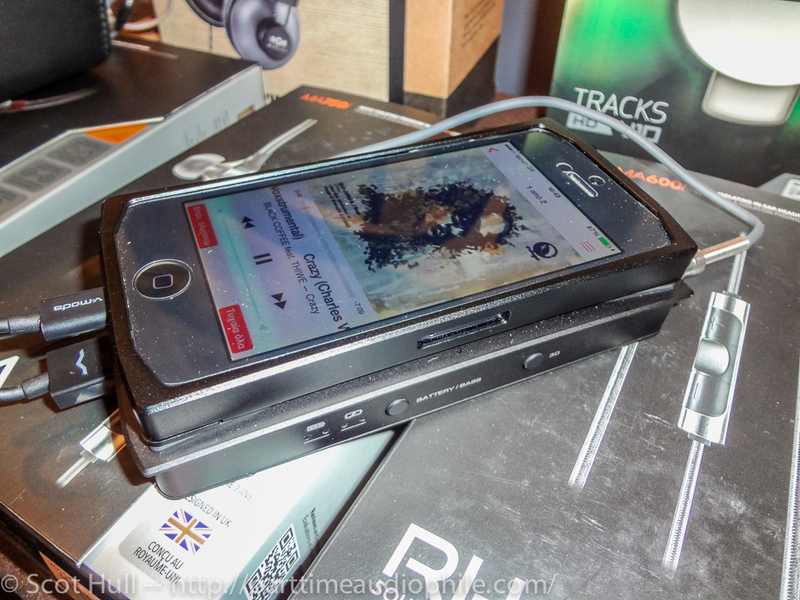 This is a slick-looking little amp, about the size of an iPhone 5S with which makes perfect partnership by gliding into the specific case that V-Moda provides. (a special case for Samsung’s Galaxy SIII also exists and I’m pretty sure one for the new iPhone 6 will follow). The Verza VAMP will provide 150mW x 2 (@32 ohm)in USB mode (Android) and 130mW x 2 (@32 ohm)in iOS mode meaning will pump your portable experience and will double as battery extender for your phone in case of emergency with the 2200mAh internal pack. 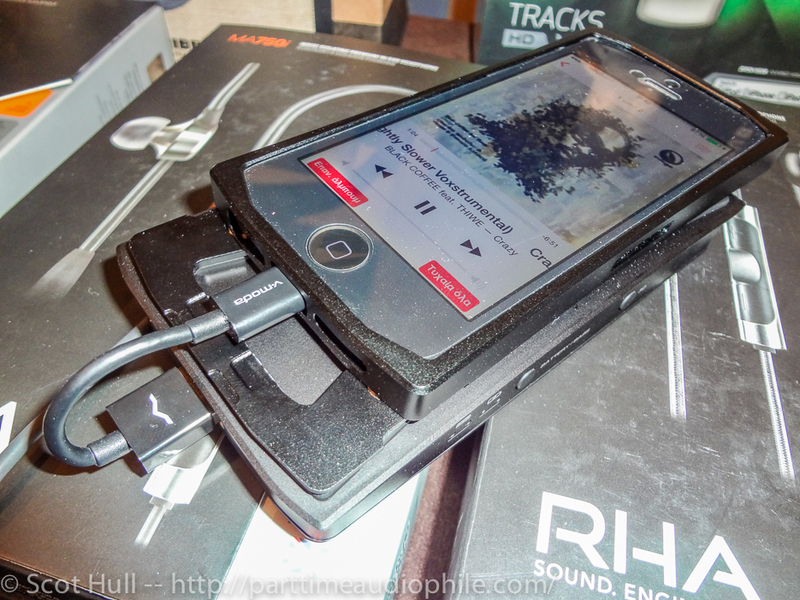 Using the same iPhone-Vamp Verza combination I gave a quick listen at V-Moda’s award winning Crossfade M 100 headphones. 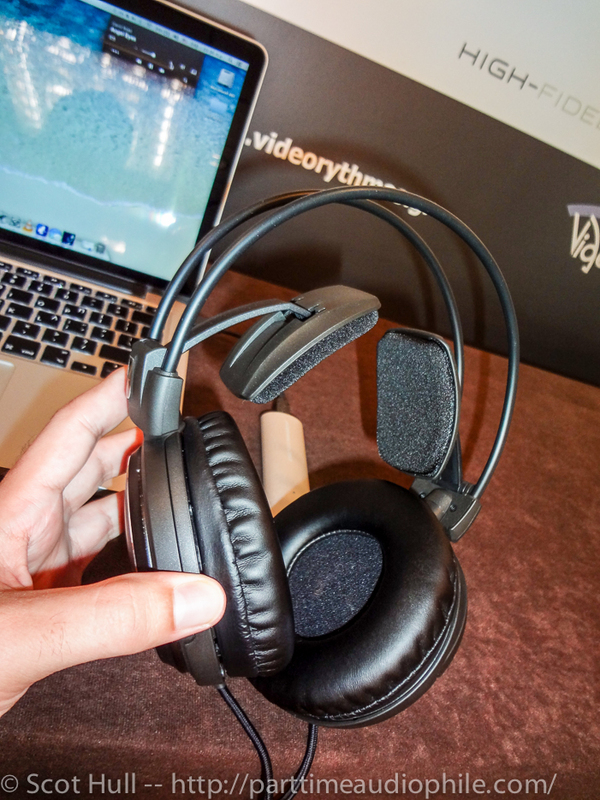 These are especially designed for DJ use and by judging the amount of pro DJs hitting the V-Moda stand I think this is not just another award. 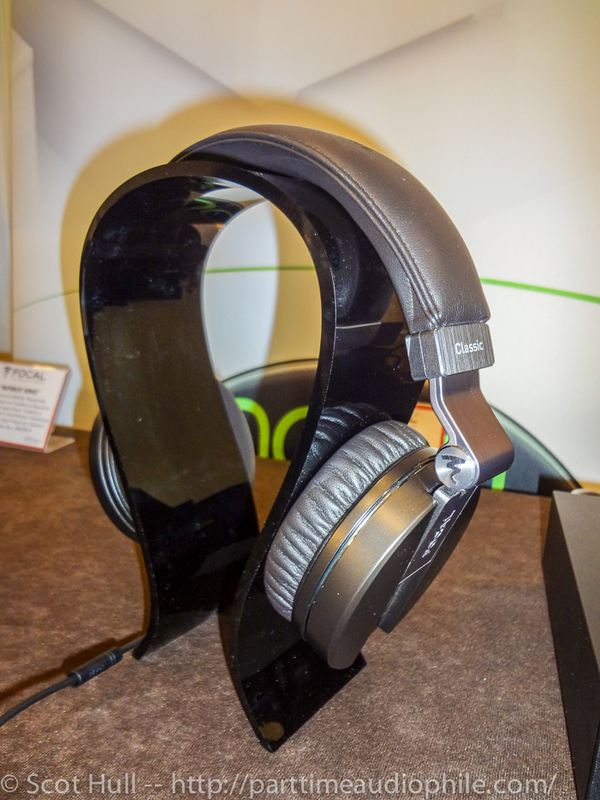 The 100s offer excellent isolation both from the outside noise and with minimum sound leakage from the cans themselves, a widely spread soundstage, pro features like clickfolding during transport or a microphone addition and an overall rugged construction that will withstand the dancing club use. Sound-wise these are very interesting pieces of gear, with fast and clean bass while mids are also well-balanced. If one adds the possibility of laser engraving the lateral metal plates I could see this becoming a terrific alternative to some well-known colorful cans recently bought by Apple. 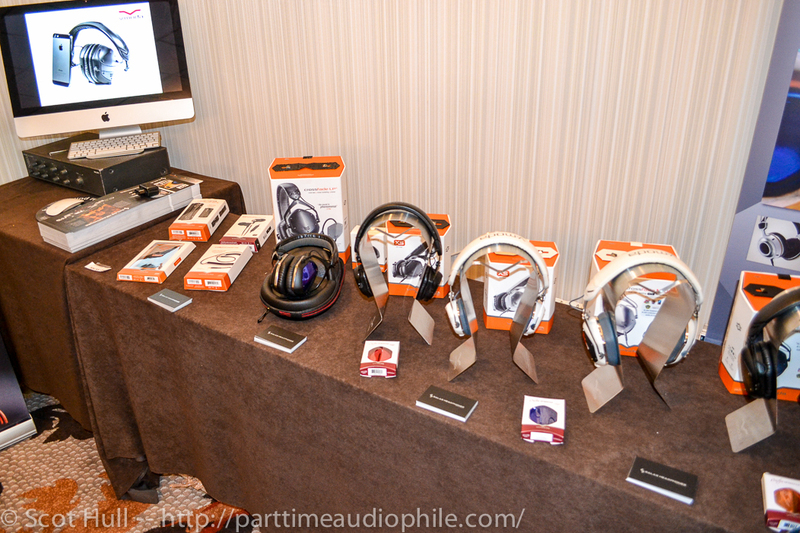 Moving to a pair of classic brands, Audio Technica joined forces with Meridian and several combinations were on display. 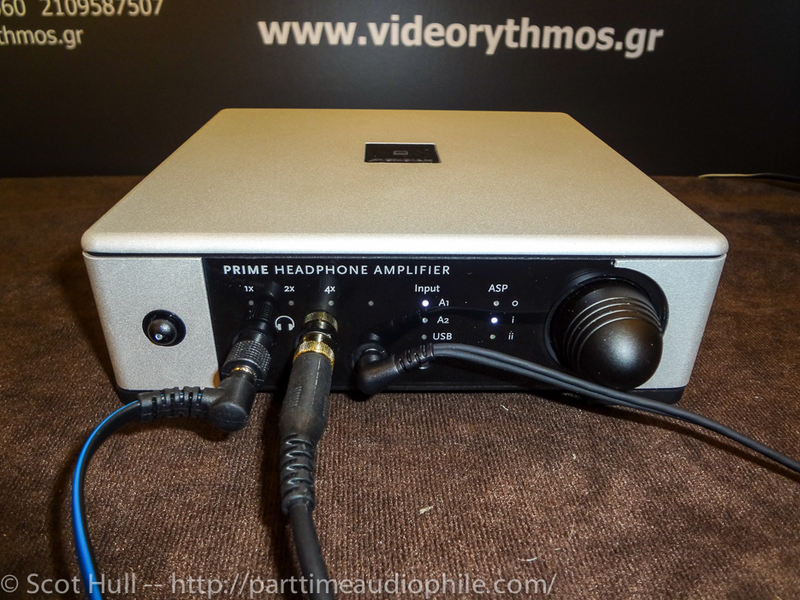 The bigger Meridian Prime headphone amplifier with its many outputs was driving several cans contemporary but my heart led me to the small Explorer, a device that blends portability and sound quality like few others. 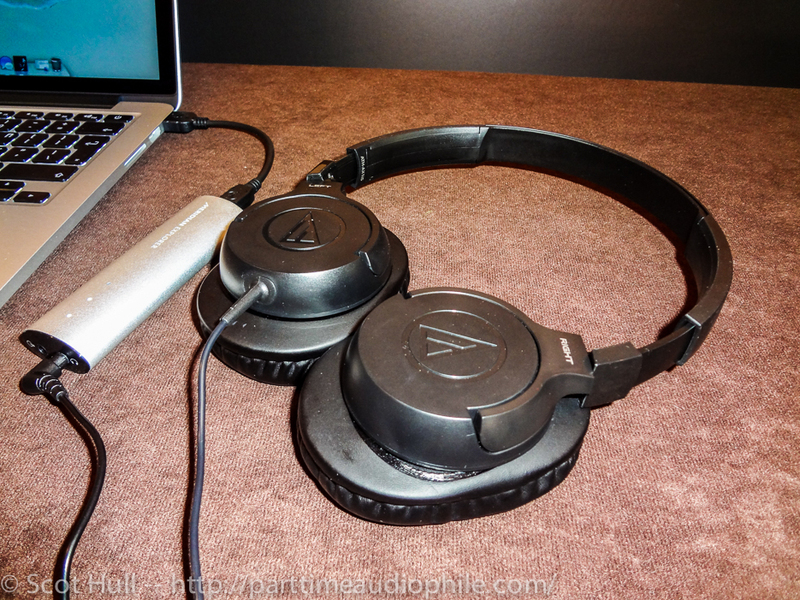 I have had the privilege of using the Explorer in the past but mostly with in ear monitors, this time I gave it a run with the Audio Technica AX1iS which are amazingly good over ear headphones especially considering the $39.95 price. Comfortable and light enough to be used for hours, a perfect every day companion. 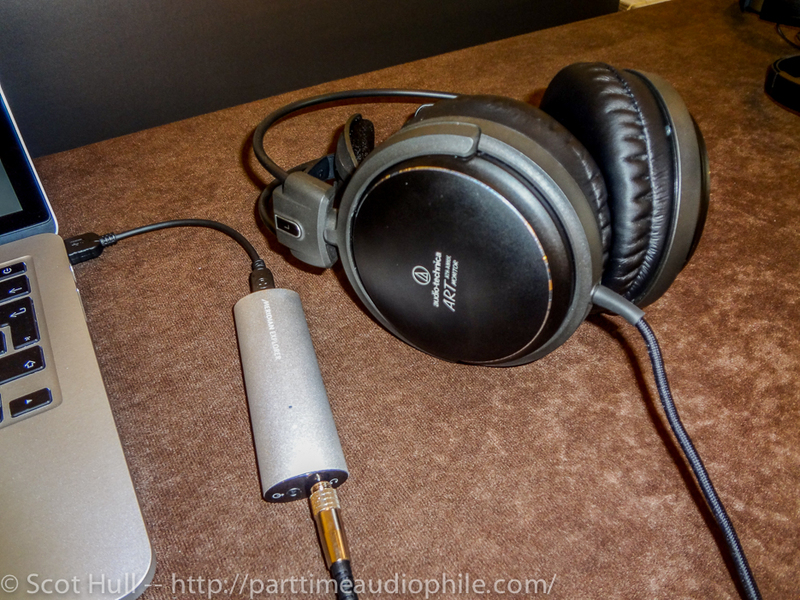 Having in front of me the big ATH A-900X I made the swap and my admiration for the small Explorer only grew bigger as I noticed how well it drove the 53mm drivers. One thing I cherish in headphones is comfort and the AT self-adjusting wing support mechanism provides one of the comfiest ways for long-term listening sessions. One thing I must report is the imaging, for being a closed back design it felt better than large part of the competition in this price range. MSRP is $300 but you can easily find these highly discounted. 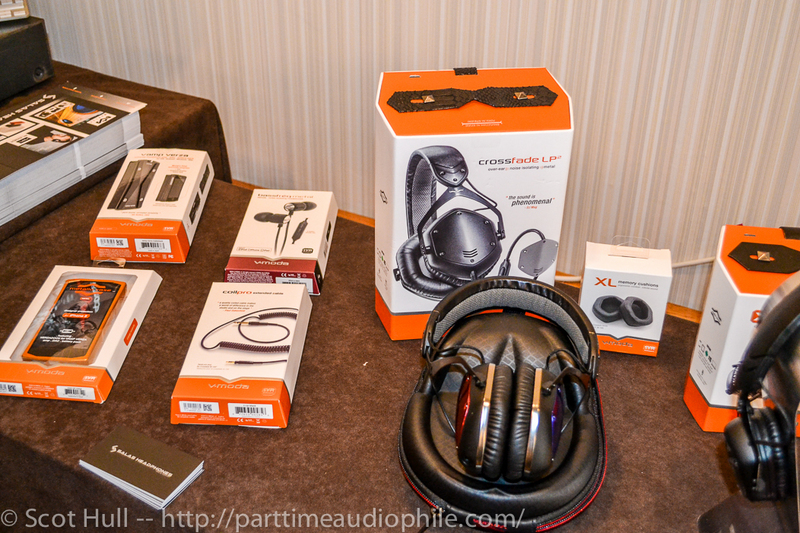 Moving into the big hall I bumped into the Aedle headphones. First a confession: I enjoy fashion but not when it comes to music and sound. I prefer an ugly as hell pair of headphones that performs exceptionally well than one which looks like as if it came out of Milan’s fashion week and then ends up sounding like crap. Especially when the price is astronomical. 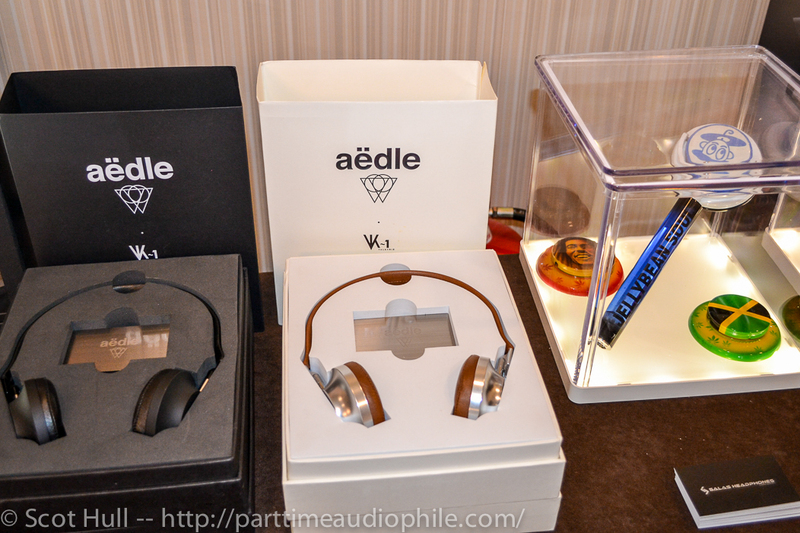 The Aedle VK-1 classic fits my imaginative bill of fashion equals expensive equals awful sound, or at least that is what I thought when I saw the elegant carton box with aluminum plate and perfectly executed leather trimming. First thing I did was to check the price. What? Only $500.. Not that expensive after all, considering that these are hand-made in France. I found the courage to give them a listen, attached to an iPod classic and “You’re Special” by Soul Creation feat. 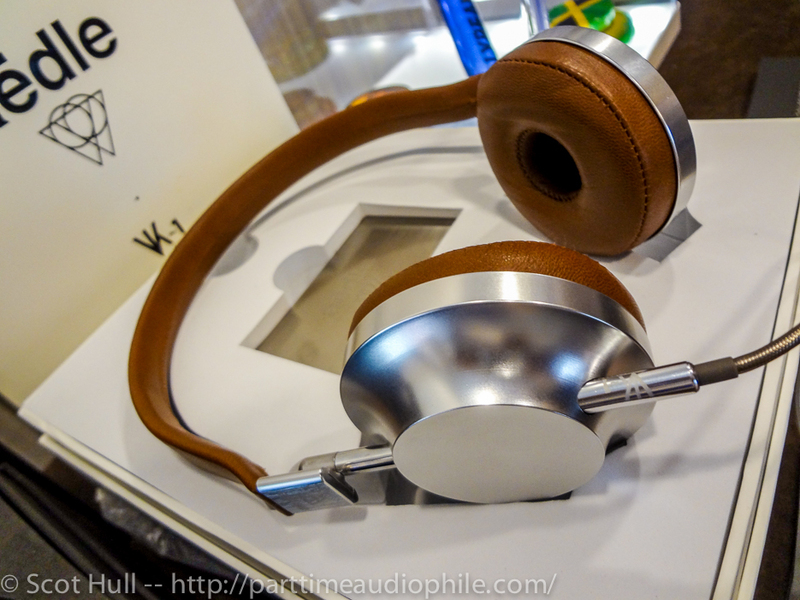 Stephanie Cooke sounded “eargasmic” (found the term on youtube’s comments under the clip..) Not sure what “eargasmic” means but the Aedles are not that bad for being more of a fashion statement than a classic headphone. 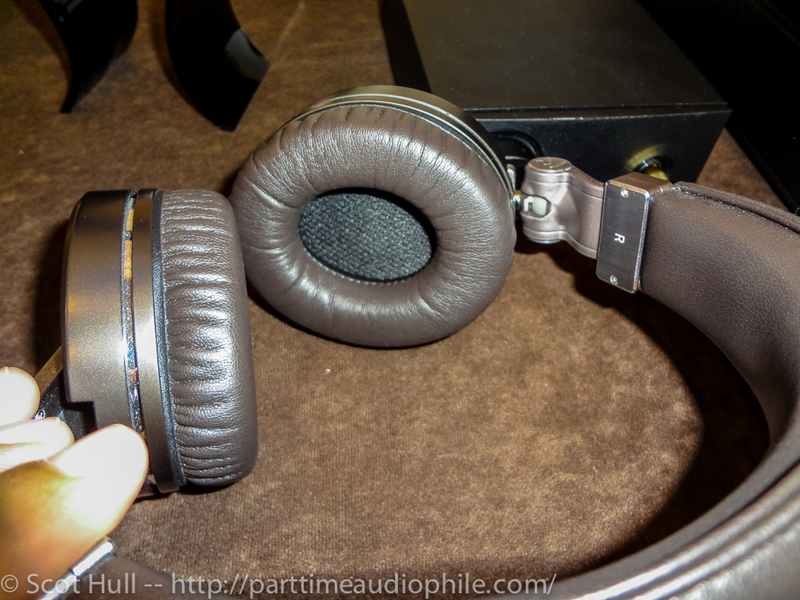 While being a pair of over the ears headphones with titanium transducers that scream “fashion statement” that do not come close to my personal taste, nor they race for best sound of the show, I would suggest to everyone who knows who Ermenegildo Zegna and Salvatore Ferragamo are to seriously consider these. (Actually Ralph Lauren sells these through his flagship stores). 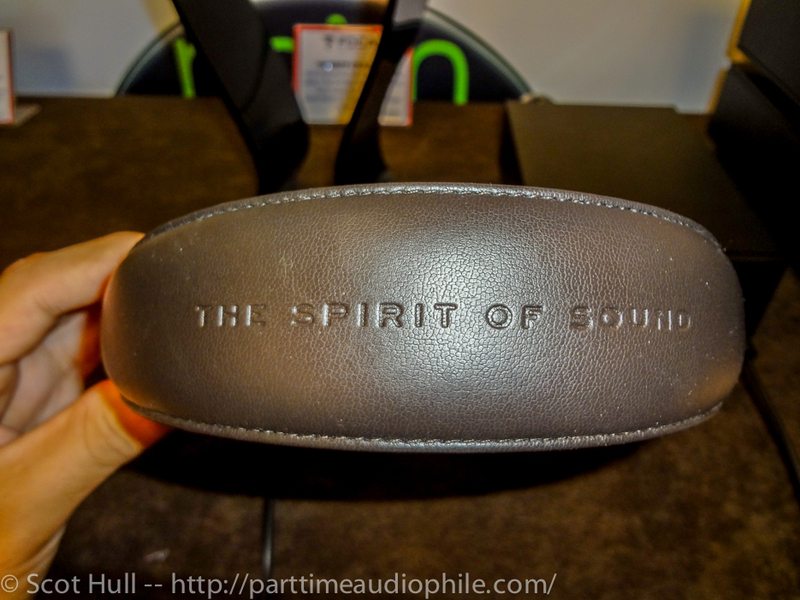 Staying in French territory, Focal recently made their debut in headphone territory with the Spirit series. 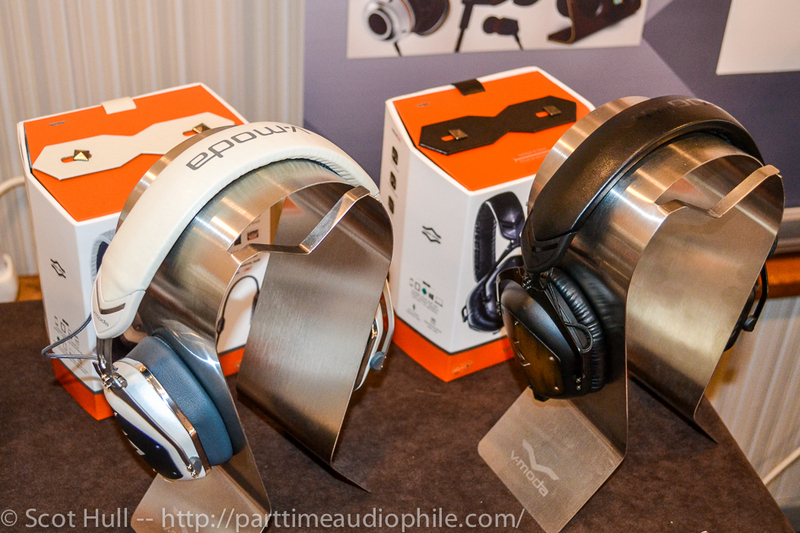 During the show all three available models were on display so I focused mostly on the “Classic”, designed for the audio enthusiast but also made an interesting A-B comparison with the Pro version. 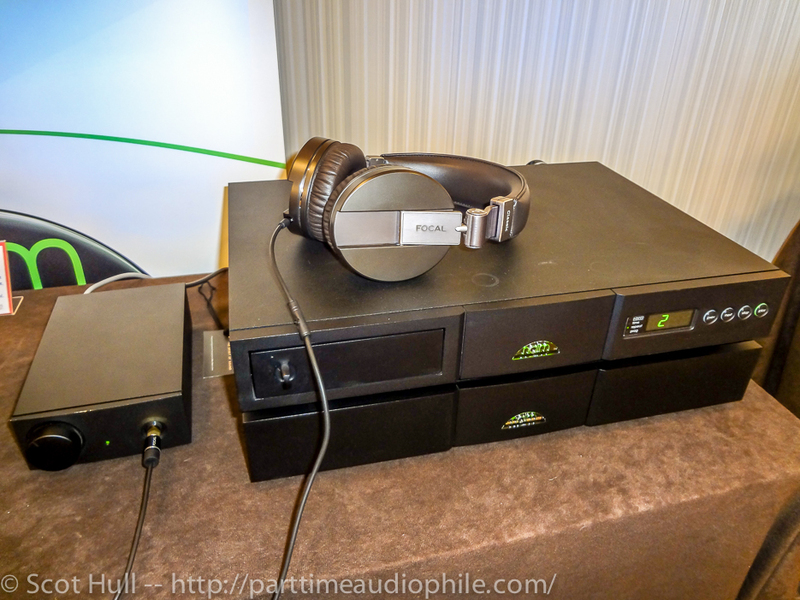 The classic was driven by an all Naim set up (the two brands are now under the same roof with Focal buying out Naim no more than a couple of years back) which included the headline 2 amplifier, CD 5 XS, Flatcap XS and NAPSC power supply. 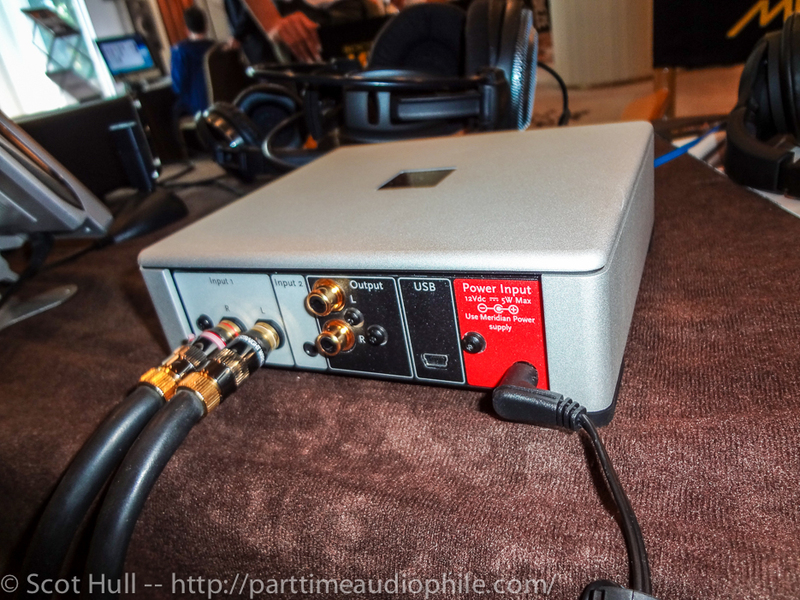 The Spirit Pro on the other side of the hall was driven by Metric Halo’s LIO-8, a well-known and highly respected ADC-DAC designed for studio applications fed by Amarra on MacBook Pro. Sounds like a clash of two worlds, the classic hi-fi vs the hard-core pro. I will take the classic hi-fi in this case, the richer harmonic content and stylish finish of the “Classic” version sounded more pleasant after a while, with the pro version resulting slightly uninvolving and dry in the long term. 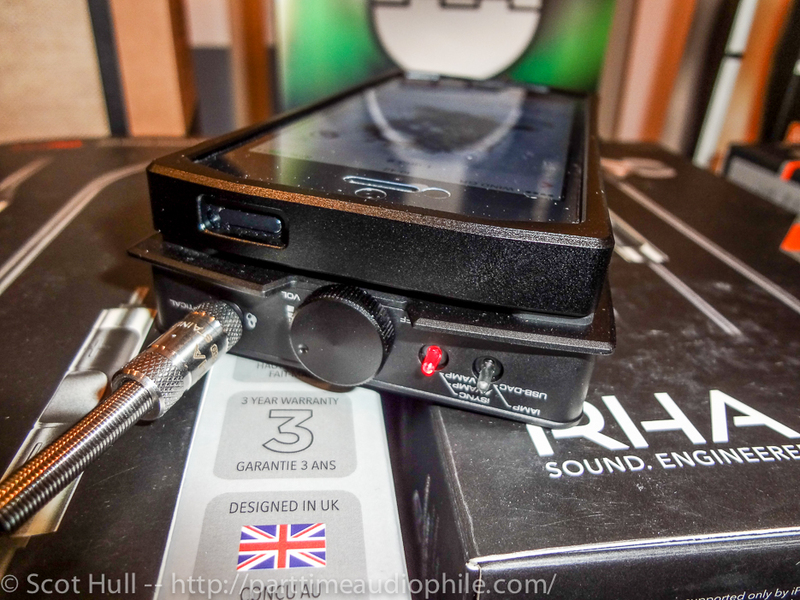 I was told that Metric Halo will make a home version of its DAC following the path of Mytek who now steadily produces DA convertors for the audiophile masses. As for the Spirit Classic, it departs from the well-known Focal sound of the last years with emphasis being given to the mids and not the higher frequencies, a turn in style which finds me more than happy. On Groove into bits Vol.2 – by Blumenhofer Acoustics the Classic the Classic excelled in air instruments and showed some fast transient responses but lacked in ultimate definition, this last feature was more pertinent to the Pro version but it might had something to do with the rest of the chain too. Stay tuned cause there is much more to come! Congratulation Panagiotis for this great review. Liked it very much.